One of the best parts of running your own business is that you get to set yourself office hours. This is great as it means you can knuckle down when it works for you rather than forcing yourself to concentrate just because you’re in a 9-5 job. However it also means that it’s very easy to fall into the habit of working when you have to and only when you have to, or never actually stopping work because you are always there. Neither are best practice – so here’s an overview of why you should set yourself work hours and the best ways to stick to them. Let’s go! WHY DO YOU NEED TO SET WORK HOURS? Productivity: By setting aside work hours you will be able to focus on what you need to get done without distractions. This will make you more productive and not left scrambling to get everything finished at the last minute. Priority: By setting yourself work hours you’re also setting yourself non-working hours. This means you have more time to do other things – whether that is focusing on a personal project, spending time with family or just relaxing. 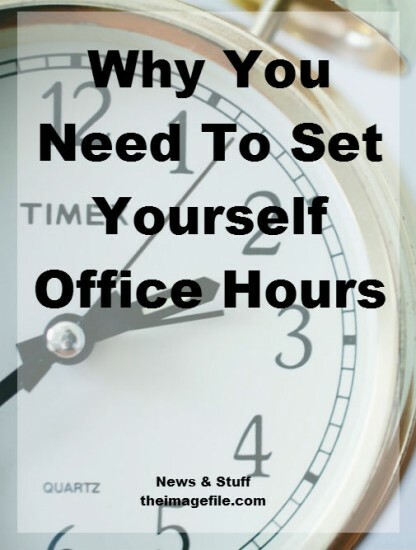 Quality: Having dedicated office hours will make your blog and social media content better. Setting aside time to focus on planning and writing your blog posts and social media updates will mean that you are producing quality content on a regular basis – rather than writing a mediocre post because you feel like you need to ‘get something out there’. Reality: By blocking out time to focus on the tasks you need to accomplish you will get a real sense of how long your work is going to take. Writing down everything you need to get done will help you realise that it’s either way too much for one day or maybe you can squeeze in a few more tasks. Be Realistic: Make a list of everything you need to get done that day and carve out sufficient time to accomplish your tasks. As we mentioned in a previous blog post it’s better to add a bit of ‘cushioning’ to your time estimates than find you’re rushing to finish on time. Be Flexible: Yes, it’s important to carve out sufficient work hours but you should also remain flexible. You’ll feel particularly unmotivated if you constantly have to turn down fun activities and events. By all means plan out your work hours and what day you are going to sit down and focus but make sure you have a secondary day in mind, just in case something comes up. Be Honest: It’s important to be honest with yourself when it comes to your business. Have a real think about your work process – what is working well for you? What could do with a re-think? How do you plan out your work schedule? Is there something that works particularly well for you?